An Edwardian view of Saltley station looking towards New Street with Saltley viaduct behind the signals. The bracket signals on the left are, from left to right, Camp Hill goods line, Main Line to Landor Street Junction and New Street, and Lawley Street goods line. 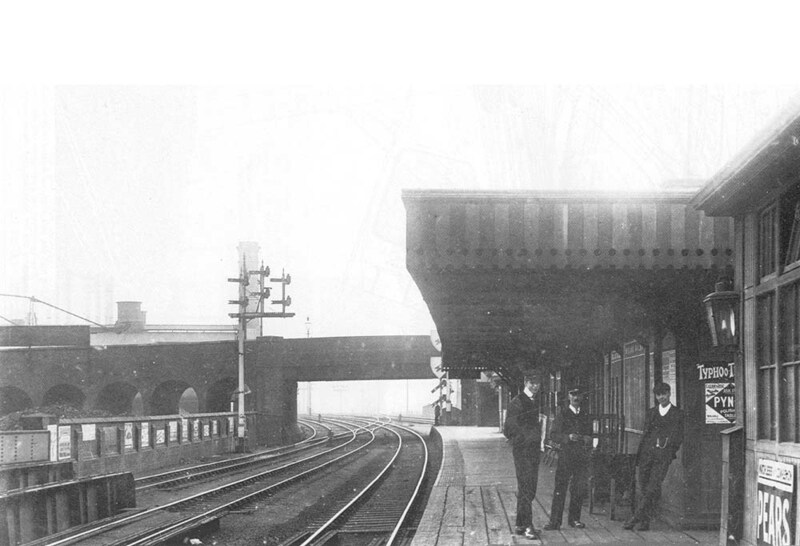 The signals on the right, at the end of the platform, were Saltley Junction's Home signals on the main line. There are two sets of signals both of which are repeated, the top two arms being placed in front of a white painted sighting board. The use of repeater signals was to aid the crew by ensuring they could easily see the signals in locations where other structures could obscure their view. The member of staff leaning on the wall is adjacent to the gentlemen's urinals whilst the building immediately to the right of the photographer was the porter's room.